Not all garbage needs to go to the landfill! Many types of paper, cardboard, metal, glass, and plastic can be recycled. In fact, most packages have a recycling symbol, and even some without the symbol can still be recycled. On plastic packaging, the recycling symbol will usually show a number (1-7) that indicates the type of resin the plastic is made of. Some areas accept more plastic varieties than others, so it is helpful to check local guidelines for recyclable material. Oftentimes, instructions can be found directly on your outdoor recycling bin. 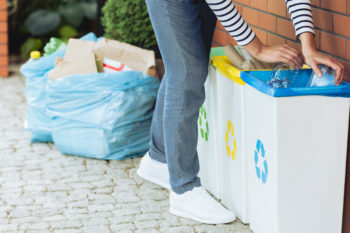 Plastic grocery bags might not be accepted by your local recycling center; however, many grocery stores offer bins for collecting old grocery bags. Better yet, buy reusable bags! Reusable items like bags, water bottles, and eating utensils reduce the amount of junk that goes to the landfill. Food waste, such as banana peels and coffee grounds, can be reused by adding them to a compost bin to make your own plant food. Basic composting instructions can be found here. LED lightbulbs may seem more expensive when compared to the cost of old-fashioned halogen and fluorescent bulbs, but the cost will be offset by how long LED bulbs usually last and how little electricity they consume. Energy can also be saved by setting your thermostat a few degrees lower in the winter and a few degrees higher in the summer, or by shutting off appliances that aren’t in use. If you are currently perusing housing options, consider the energy efficiency of apartment living versus single family homes. For more information on eco-friendly living, contact us! We’re happy to offer ways on how to foster a greener lifestyle.